Please read part one if you haven't already. The next morning we got up early for the four hour drive to the trail. Take a moment to click on this image to get an enlarged view of our van. Check out the amount of equipment in the back. We fit 15 people into this van. Here's another view of the miracle, clown car van. Andy, Tom, and I were quite comfortable, we got a whole row all to ourselves. I have no idea how they fit so many people in back of us, they were so quiet I had no idea they were even there. Something worthy to note, every vehicle in Africa is a Toyota and there is no place on earth where vehicles get more use than Africa. 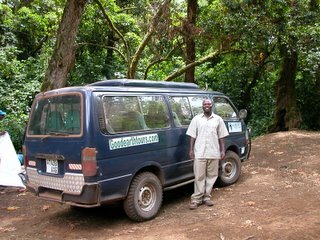 This van had 168,000 miles on it and it carried us over some of the most beaten roads I've ever been on. After a drive through the scorching dry and dusty plains, we started to ascend and drove through a mountain logging town, which featured row upon row of dilapidated shacks. Everyone in the village stopped to stare at us, which made me extremely self-conscious. The children were adorable though. All through the town, they ran out with beaming faces waving and smiling at us while wearing tattered rags. They broke my heart. I wish I had taken a picture of them. In the photos above, we are posing at the Londorosi Gate, a gate few tourists pass. The vast majority of climbers take the Marangu route up, which is so popular it is nicknamed the "Coca-Cola" route by the natives. If there is one American brand the Tanzanians have an awareness of, it is Coca-Cola. Coke sponsors just about every street and town sign in this country. I found it quite gross. 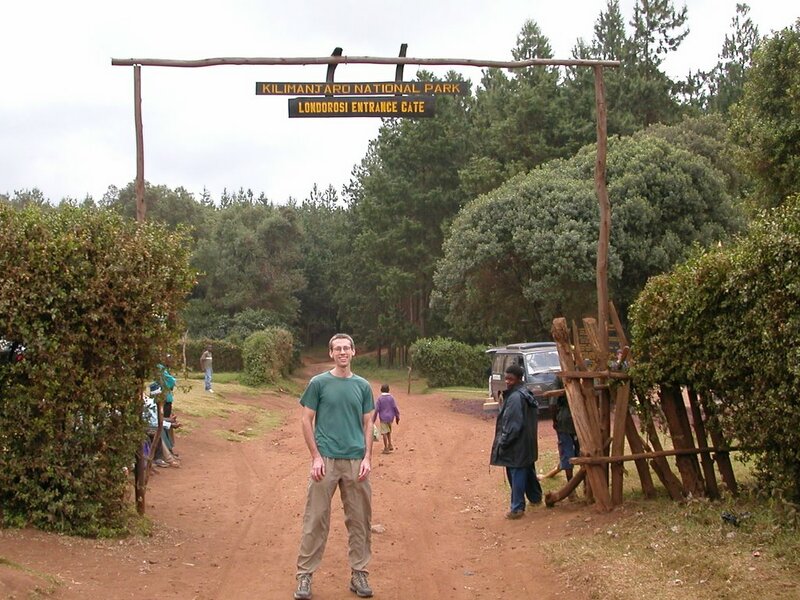 The Marangu route is a much quicker ascent than the Lemosho trail, the route we took to the summit. It is only four nights while Lemosho is six. Consequently it features the highest dropout rate of all the trails. Our head guide Amani, who had climbed Kilimanjaro over 200 times, said only two out of ten climbers on Marangu make it to the top. The amount of oxygen at the summit of Kilimanjaro is less than half the amount at sea level. Giving yourself more time to acclimatize to the altitude is not just a good idea, it can save your life. According to Tom's book a man once jogged up to the summit of Kilimanjaro. This would have been a big accomplishment if he hadn't had to spend the next four weeks in the hospital. One word the guides kept repeating as we climbed was "Po-le, Po-le", which is their version of "Take it easy." 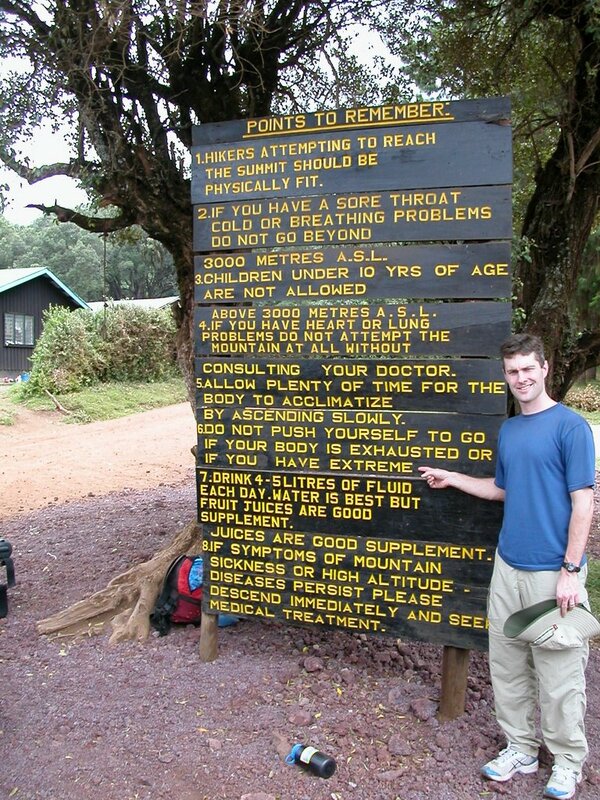 If you are climbing Kilimanjaro, my advice is go slowly, eat, and drink plenty of water. In the photo above, I am pointing out the warning to stop hiking "if you have extreme." We were at the Londorosi gate for an unexpectedly long time as our guide negotiated with the park ranger. 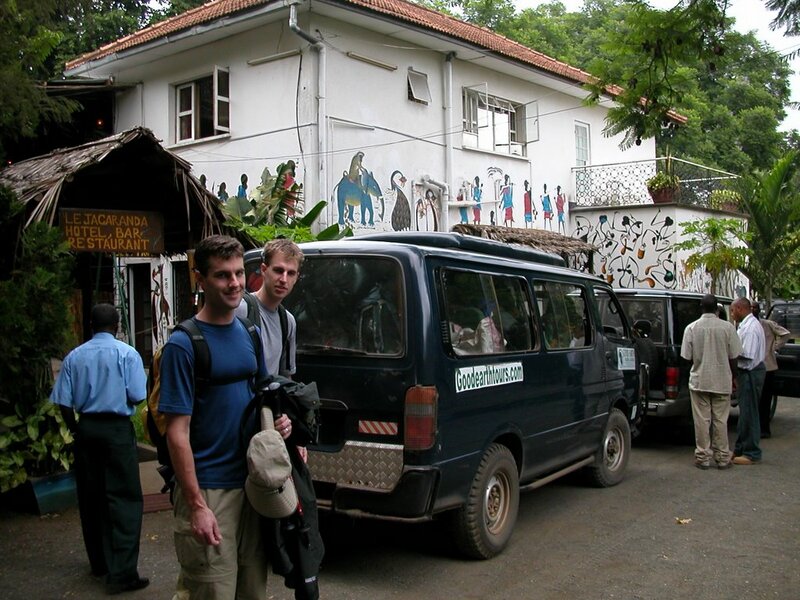 Nothing bureaucratic happens in a hurry in Tanzania. If you find yourself dealing with a government official, prepare to be there for a long time. I've never seen so many ambulatory people gathered in one place doing so little. Here's a Colobus monkey hiding in the trees, our first photo-brush with wildlife. Previous to this sighting, we saw a troop of baboons in a field, which was fascinating but we missed photographing it. Colobus monkeys get their name from their lack of thumbs, the word "colobus" means "mutilated one." I thought a much better name was "skunk monkey" because they are black and white and have a giant poofy tail. I called them this for the rest of the trip. Let's see if it catches on. Meet Joseph, our driver. 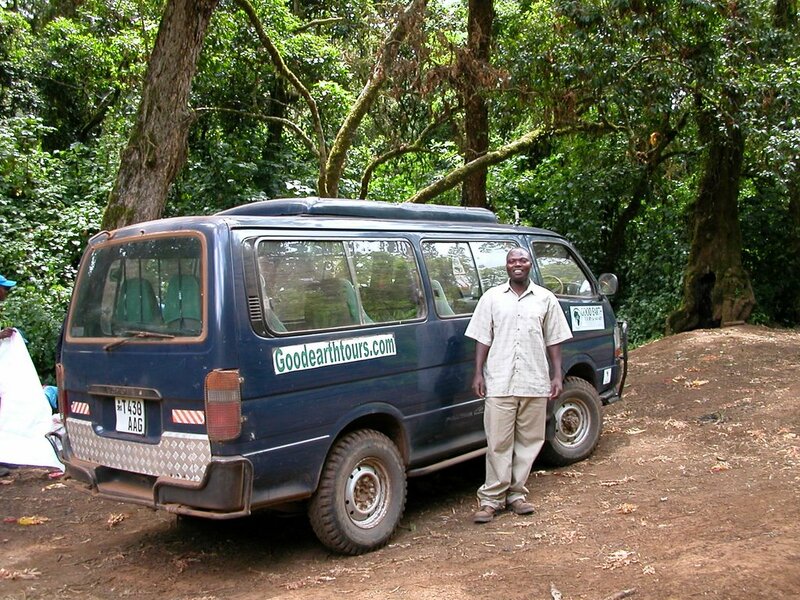 Joseph drove us successfully over treacherous, rutted, dirt roads to the trail head. One thing I learned from this 4x4 off-roading, it is not half as glamorous as the SUV ads make it look. Off-roading is slow going and there is not a moment of freewheeling excitement to be had. A lot of the time you wonder if you are going to roll off the side of the mountain or get stuck in mud. 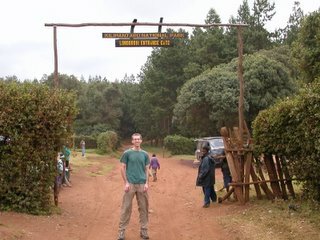 Here's Andy in the subtropical rainforest, the first of the five ecosystems we passed through on the way to the summit. For you science junkies, they were, in order - subtropical rainforest, heather, moorland, alpine desert, and polar. Along the trail we saw more skunk monkeys in the trees and came across elephant dung and tracks, no elephant though. I tried to convince the guys to take a photo of the dung but they said it wasn't photogenic enough. The Swahili word for elephant is "Tembo" which I thought sounded cool. 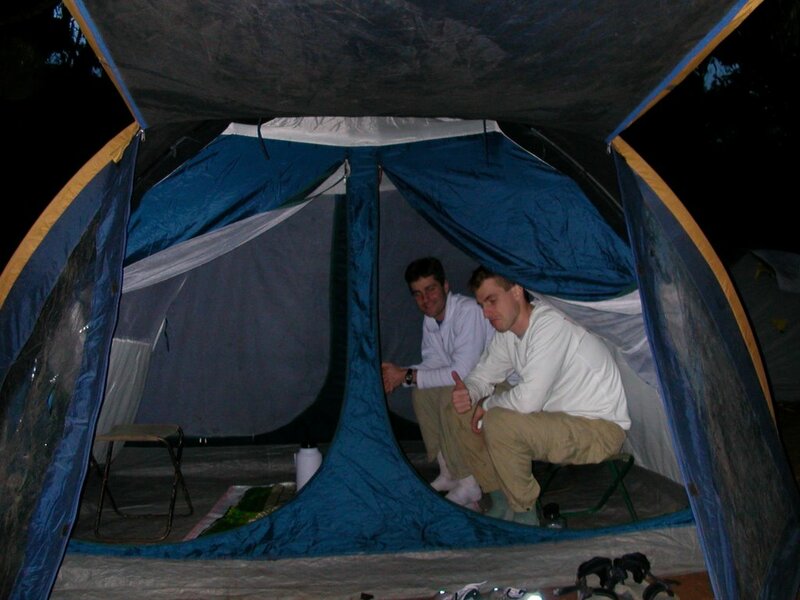 Here's Tom and I at our first campsite, Mkubwa. The green shelter is for the park ranger who lives in that structure for weeks at a time. We started at 5,000 feet in Arusha and at this campsite we were at 9,000. Sleeping at altitude is more difficult the higher you go. By the end of this trip I had racked up such a sleep deficit I was delirious. On arrival, Andy checked out the facilities which he pronounced "adequate, actually not too terrible." Despite being an avid hiker, this trip was the first time I have ever used a pit toilet. When I canoed down the Allagash in Maine, I had such an aversion to outhouses that I didn't go to the bathroom for four days. When my stomach eventually forced me to go, we were in the middle of the river and we had to quickly paddle to shore, where I jumped out and went up to my thighs in mud, slogged to shore and ran to a private area where I battled mosquitos while trying to do my business. It was one of the top ten most unpleasant experiences in my life. Back at the Jacaranda hotel, we had met a friendly Ukrainian who gave us a folding toilet seat we could prop over the pit. It made things a lot more pleasant than gripping the walls for balance. Even so it didn't make it a bathroom you wanted to hang out in and read the paper. On our last day, we kept up the good karma and passed the seat on to a friendly couple from Oregon. Sorry to go into such detail about the toilets. 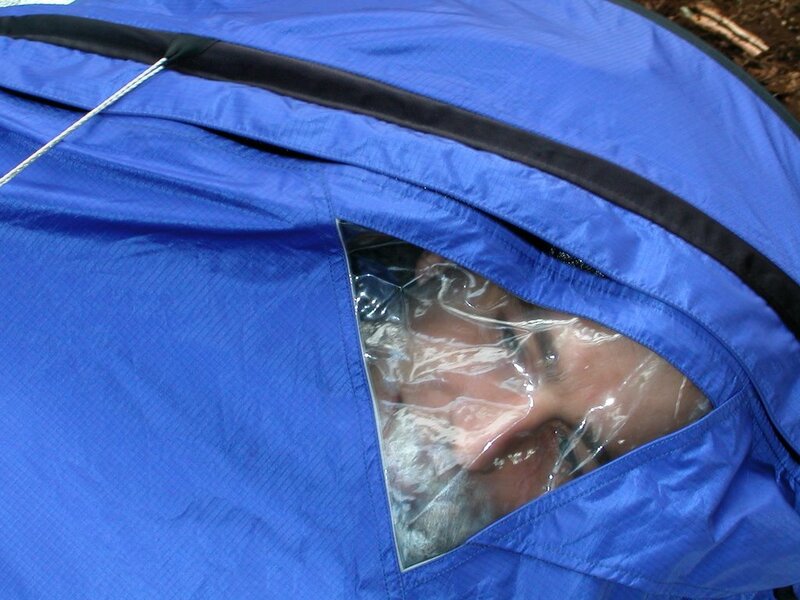 The guides and porters got a big kick out of Andy's insistence on sleeping in his bivy sack. Andy paid $300 for this claustrophobic coffin/tent and because he paid so much for it, he insisted on using it even though there was room in my tent for him. 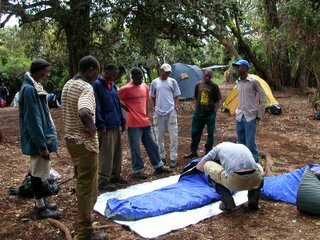 In this photo, Andy is demonstrating the virtues of sleeping in a bivy for our guides, who are all laughing and joking in Swahili. Here Andy enjoys the comfort of his bivy sack. It took two nights before Andy abandoned the use of the bivy forever and joined me in the tent. I'm almost embarrassed to show you the luxury the guides provided for us. 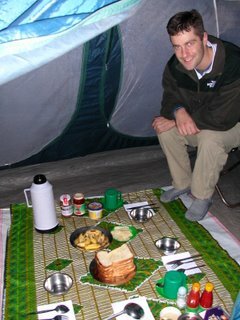 Every night the porters set up our sleeping tents and a mess tent, boiled our water, and cooked us dinner. In the morning, they cooked us breakfast, gave us a bag lunch to carry on the hike, and broke camp. The food was fantastic and plentiful even by American standards. They even accomodated my vegetarian diet, a concept our guide confessed to me later that he did not understand. 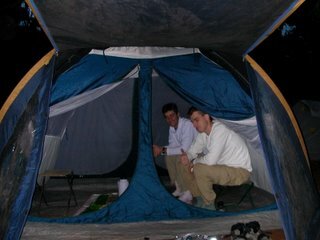 Andy and I relaxing in the mess tent after a day hiking in the rainforest. Andy approves. At this point we were all taken aback by how nice the accomodations were. I got the impression that if you asked the porters to carry you on their backs, they would do it without complaint. Night fell quickly in the rainforest. It was almost impossibly dark and, of course, I woke up early and lay in my sleeping bag for two hours, listening to the animals in the night. One of them made a piercing screech which made me shiver. Insomnia plagued me throughout this trip. I'm having a lot of trip envy, reading this -- but how fantastic for you! As for the toilet detail, I actually drew pictures of some of the toilets I used in Vietnam (in my travel journal) a few years back...maybe a lot of people are fascinated with the place they deposit their business? Sandra - I thank you for reading it! At the summit my brother had an experience w/ toilets which was, uhm, unpleasant. I can't decide if I should include that part in this narrative or not. Please tell me about the toilet seat - brand, etc. Did it take up a lot of room? Is it heavy? Thanks! Hello, I came across your blog while I was googling. My husband and I just finished our trip in Tanzania a week ago. Our driver was Joseph, too. He was a great driver and an awesome tour guide, too. Quite a nice recount and narrative. You must have enjoyed your self but the way your recount the tour amazes me. Looks more like a documentary you were preparing. All travelers should borrow a leaf from you on how to document their trips. Wonderful! I like the fact that you can make a table for dinner in such detail inside a tent. funny but very practical.